SoFi’s #2BillionTogether contest has its members personal student loan debt stories trending over social media. NEW YORK (MainStreet) -- Millennials looking to have their student loans paid off are vying for support on social media as part of a contest from SoFi, a San Francisco-based marketplace lender and student loan refinancer. For those burdened by the student loan crisis -- with Americans owing $1.2 trillion in total -- Twitter and Facebook campaigns to garner votes in the contest may be just the antidote to secure financial liberation. This contest began two months ago with over 24,000 candidates who had refinanced their student loans through SoFi. On SoFi's contest web page, participants uploaded a photo and a short bio with special SoFi details on how refinancing their loans has impacted their lives and how getting the rest paid off through the contest would benefit them further. The SoFi staff then choose 20 finalists based on how compelling their personal narratives were. "We chose people who we thought were deserving and had achieved something or were on the road to achieving something great," said Daniel Macklin, co-founder and vice president of business development at SoFi. "As we lent out more money and interacted with more customers, we noticed the great stories they have to share and we wanted to reflect that." Since its start in 2011, SoFi has surpassed $2 billion in loans. The company is using its alternative lending platform to eliminate student debt en masse, promoting its efforts through the contest's Twitter hashtag #2billiontogether. Bringing the true personal details to the debt figures and statistics was the foundation for this contest initiative, the company said. "Since we hit $2 billion, we wanted to do something to involve members," Macklin said. "These are real stories from real members." Voting to pick a winner among the finalists began this Tuesday and is now left up to the public to decide. One member will have his SoFi refinanced student loan paid off for this fiscal quarter. 28-year-old contest participant Erin Costello, a Brooklyn resident who work as a vice president and project manager at JPMorgan Chase, had a total of $170,000 in student loan debt after finishing her schooling. "Unfortunately I graduated right after the market crash in 2009," she said. "Given the lack of job opportunities and the desire for advanced degrees, I immediately went on to my master's." By the time Costello graduated in 2011 with her master's in global affairs, she had two sets of loans. For her undergraduate degree from Virginia Commonwealth University, the private loan lender Maine Educational Loan Authority gave her an 8.5% interest rate on a $49,000 loan. In theory, the loan had a flexible interest rate between 6% and 8.5%; however, the interest rate consistently stayed between 8.36% and 8.43% for the three plus years Costello was in repayment. Deferring this loan through graduate school burdened her further with about $15,000 to $20,000 in interest payments. When she entered repayment the total loan was approximately $65,000. It got worse. For her graduate degree from New York University, federal loans ran her 7.9% interest rate, she said, amounting to about $122,000 in debt. Because of the high interest rate on this loan, the balance has remained the same while Costello has continued to pay $800 or more each month for four years. 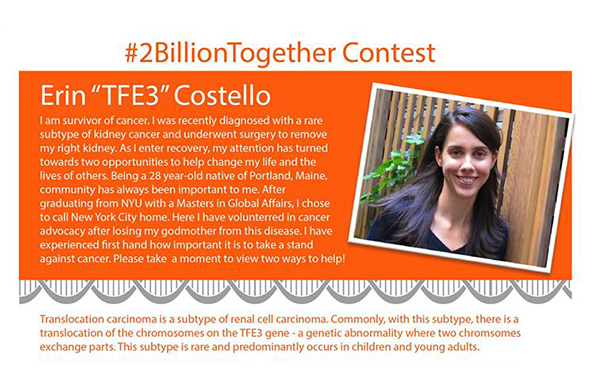 While student loan debt was enough for Costello to enter the contest, she has also been battling a rare subtype of renal cancer that results from a genetic abnormality. In her SoFi contest profile, she has emphasized the financial and health care struggles she's facing in hopes of bolstering her chances of getting votes and winning. Currently she has 981 votes. The personal stories for the rest of the contest participants are similarly rich and often heart-wrenching -- bringing a human face to the debt crisis. Take Nick Stahlschmidt, a family doctor who helped fight Ebola in Sierra Leone and has been fighting student loans since medical school. He currently has 2,580 votes. There's also Darcy Phillips, a physical education teacher now business manager for a privately held mid-size manufacturing company with dreams for helping others sustain active lifestyles has nightmares of unpaid MBA student loans. He's garnered just 257 votes. SoFi does have a clean track record so far with only a couple of defaulted loans; however, this marketplace is still just four years young with a lot to prove in experience. When deciding where to refinance student loans, Mark Kantrowitz, a nationally recognized expert on student loans and vice president and publisher of Edvisors.com, says it's best for borrowers to shop around, applying to several lenders in order to compare the actual costs. "You cannot just pick the lender with the lowest advertised rates, as very few borrowers get the best rates," he said. "Rather, each borrower's decision needs to be personalized, based on the actual interest rates offered to the borrower by each lender." The subtext for this contest, Kantrowitz says, is something of a PR move to bolster SoFi's prominence in the student loan debt sphere. SoFi, of course, benefits by gaining exposure through social media where Millennials are most heavily influenced to go on for fast news and updates. "This contest lets SoFi associate itself with the stories of its borrowers who are giving back to society," said Kantrowitz. SoFi contest participants with more publicity and a higher quality filter on their profile picture will attract a wider group of supporters. The participants can take advantage of multiple mediums like Facebook, LinkedIn and Google+. All the while, SoFi increases its brand recognition and helps to personalize the tribulations of the student debt crisis. Using TweetReach.com to look at the #2billiontogether hashtag, Kantrowitz recognized the success in the contest and its ability to raise awareness of the dire straits many are facing with their debt load. "With 50 of the estimated 607 tweets reaching almost 30,000 accounts, it appears to be a modestly successful social media campaign," he said earlier today. By publication time this afternoon the estimated total number of tweets went up to 708.